Microsoft® Agent technology is a set of software components that are an extension of Microsoft's Windows® operating system. These components provide a foundation that enable developers to incorporate interactive animated characters into their applications allowing for more natural ways for users to communicate with their computers. These characters are capable of speech, via a text-to-speech engine and can even accept spoken voice commands via speech recognition software. A visible interactive personality empowers a broader and more human like interaction between users and their computers. All versions of Windows 2000 including Windows Me and XP already makes use of MSAgent Technology with the Office Assistant. This Microsoft utility contains various components that are part of your windows operating system which are utilized by other programs to provide speech and animation. Other programs make it possible to expand the use of this technology beyond office assistant and now you can have an assistant & companion available on your desktop anytime doing a variety of common tasks. So exactly what do I need? FIRST, Windows 95/98 users will need to install the Microsoft MSAgent components on your computer which are FREE and can be obtained from our MSAgent downloads page (Windows 2000 and beyond already have the MSAgent core components installed]. SECOND, you need a desktop application programmed to have the characters do tasks for you. 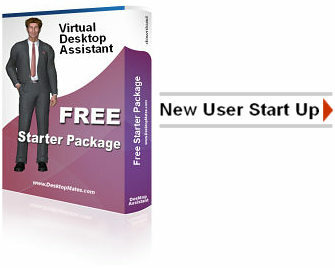 "CyberBuddy" is an example of a program that does this and can be obtained FREE from the new user start up page. THIRD, you need a character such as "DesktopMates" that are programmed and designed to operate with these applications. A sample version for one of the DesktopMates characters can also be downloaded FREE from new user start up page, or alternately can found in the "Free Extras" section from the main menu. The new user start up page has complete step by step instructions that will explain in further detail what you need and help walk you through the procedures to get up and running. DesktopMates characters are digital software components consisting of complied sets of various animations, but DO NOT operate by themselves as a standalone program. A character's animations and speech are generated by the "Microsoft Agent Core Components" in conjunction with third party MS Agent applications such as "CyberBuddy" and the "Answerpad" or "Ultra Hal" Artificial Intelligence Programs which utilizes the character's animation software along with the Microsoft Agent core components to make a character function and speak etc. The type of tasks a character can do as well as the amount of activity as to when and what animations are used and what a character says will mostly depend on the application you are using to operate your character, so be sure to thoroughly read the documentation and help that comes with the application you are using to operate your character in order to get the most out the programs as well as your character. Click the "Technical" button to view a schematic and detailed info on how this technology functions, this will provide you with a general idea on how it works and how all the components tie together. The "DesktopMates" character floats independently on your desktop waiting for commands from you that are provided by the program being used to operate the character. The character can be placed anywhere on your desktop by dragging the character with your cursor (however, when doing this the character can sometimes get annoyed when you grab and move them and will often express their disapproval). The characters are fully functional with speech and animations that are sometimes for practical purposes and sometimes just to entertain you. We like to refer to "DesktopMates" as desktop assistants and companions. - Verbally give your local weather report. - Tell you when email has arrived. "CyberBuddy" is also an instant online messenger where you can talk to other "CyberBuddy" users through your "DesktopMates" characters and you can even send animations along with your text speech. Also Check Out CyberBuddy's CD version with Speech Recognition. You can also upgrade your free version of CyberBuddy to the speech recognition version which will allow you to give spoken commands to your character such launching programs, opening web pages from your favorite bookmarks, change characters, dial a phone number of a friend and much more. Get Started Now! ... all required software components to operate a character are available FREE!